The exquisite limited edition print that represents Hungary features a number of unique images of some key people in Formula One™, capturing special moments in F1™ history. This print shows: Zsolt Gyulay – President if ASN and Hungaroring, writing his own individual collaboration, Jenson Button holding up his 1st place trophy in victory, Jenson Button’s McLaren car racing on the track and all three drivers standing on the podium. 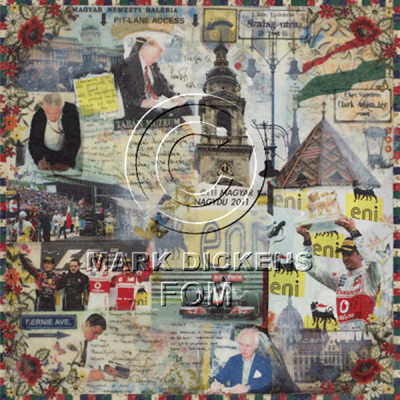 Mark Dickens depicted the city’s beautiful architecture by including images of the iconic bell tower in Budapest, the Government’s Palace and the much loved Modern Art Museum. He has finished the print with a traditional Hungarian floral design and pieces of local fabric that are cleverly incorporated to create a unique border. The original painting was presented by My Bernie Ecclestone, CEO of Formula One™ Management, in a special ceremony to Thomas Frank’s daughter, who accepted it on her late father’s behalf during the Grand Prix race week in Hungary, season 2012. “ENI has held a passion for Formula 1. For 36 years, the Grand Prix of Hungary has had our name on the entrance.”Angelo Fanelli - COO ENI.